Our custom Fleet Solutions Program is tailored to your specific needs and fleet. Whether you have 5 or 500 vehicles in your fleet we have a solution for fleet to operate cleaner and more efficient. Example: Based on a Vehicle Economy Efficiency Report. 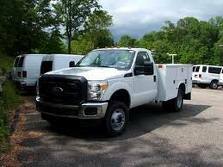 With our economy tune a 2006 Ford F250 6.0l diesel truck has an avarage of 19.26% gain in fuel economy. In addition our solutions program offers many options for the problemed diesel 6.0l ford. Lowering maintenance costs and costly down time due to repairs. Such as EGR corrections, head gasket failure and oil cooler upgrades.